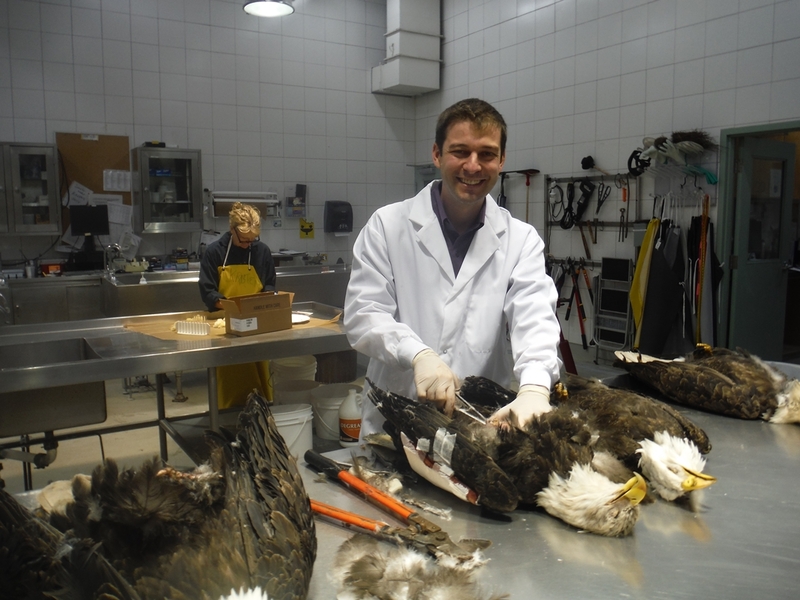 The BC node of the CWHC would like to introduce Avian Pathologist, Dr. Eric Parent! Eric joined the Ministry of Agriculture as a poultry health pathologist in September 2015. He grew up in a small rural township 30 minutes south of Quebec City, where he was initiated early in his life to agriculture as his parents owned a swine, broiler chicken, turkey and beef farm. His interest towards agriculture and medicine led him to join the Faculty of Veterinary Medicine of the University of Montreal in 2008, where he obtained a Doctorate in veterinary medicine in 2013. He then pursued a Master’s degree in veterinary medicine at the same school. He focused his research on antibiotic-free broiler chickens production in order to reduce the amount of antibiotics used in poultry medicine and therefore decrease the risk of bacterial resistance to antibiotics. He also transferred his knowledge to poultry producers by monitoring antibiotic-free chicken flocks as a private veterinarian. After his Master’s degree, Eric decided to move to the beautiful Fraser Valley to provide diagnostic and veterinary extension services to poultry producers of British Columbia by working as a poultry health pathologist at the Animal Health Center in Abbotsford. He is strongly devoted to poultry health and his role through his new position at the Ministry of Agriculture greatly satisfies his interests. While Eric is not working, you can find him discovering his new home by exploring the beautiful Province of British Columbia. He plans to increase his mountain biker skills by ascending and descending the numerous mountain bike trails in the surrounding area. He will also trade his pedals for skis, as the Rockies offer dream conditions for a skier originating from Quebec.